Today's plan for Valentine's Day was to sleep in a bit, then drive over to Carson City, have Second Breakfast at the Carson City Nugget, then go to the Nevada State Railroad Museum, where Lisa and I have a family membership. The first portions of the plan went well. When we got to the CC Nugget, however, we found that they had completely remodeled their coffee shop, and not for the better. Smaller restaurant, window onto Carson Street gone, fewer servers, no keno boards, and after fifteen minutes all we'd gotten was a cup of coffee, but nobody to take our order. We overheard the supervisor explaining that servers were now also responsible for being cashiers and busing tables. When the server finally got around to us, Lisa balked completely. I gave the server $2 for the cup of coffee and we left, and we probably won't ever come back. The management has to balance the loss of return customers like us against whatever cost savings they get from firing half their staff and whatever new revenue they might get from people attracted to their new look. At the suggestion of a similarly-disgruntled restaurant patron, we went to the Fandango Casino, where we had the Saturday Buffet Lunch. It was, I thought, pretty good, with omelets to order, decent hash browns, very nice patty sausage in the breakfast and a nice if not spectacular spread of other brunch food. Lisa said the seafood was dried out and that she didn't trust the look of the eggs Benedict. Also on the minor downside, while they have keno boards, they have no keno runners, so if you want to have a game to watch, you have to buy your ticket before dining. Nevertheless, we may try this place again. After brunch, we went to the museum. Thanks to our restaurant misadventures, it was nearly 3 PM by the time we got there, and they close at 4:30, but we had an entertaining short visit anyway. We looked in on the locomotive Glenbrook, being restored in the backshop and finally having had its boiler inspection, after an almost comic series of misadventures and an eight month delay that we were told was not resolved until a friend of the head of the state agency that oversees such things intervened to get them to fly the only boiler inspector in the state who knows anything about steam locomotive boilers up from Las Vegas to both inspect this boiler and also educate the Northern Nevada boiler inspector how to do it. I walked through the main hall exhibits while Lisa talked with the museum staff, as she enjoys doing. 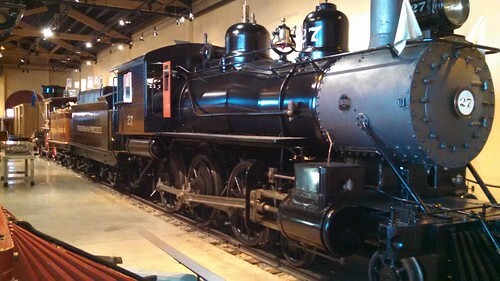 Here's Virginia & Truckee locomotive 27, all dressed up in the main display area. 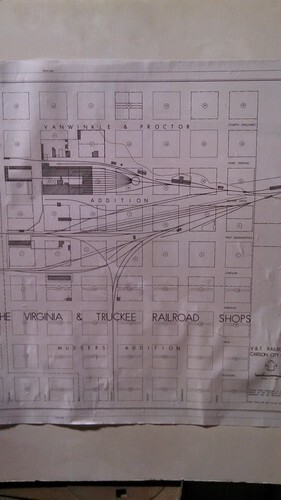 While out in the backshop, I took this picture of a map showing how the original V&T shops were situated in Carson City before they burned and were torn down in 1991. I later found a much better image of the same map in the Library of Congress archives. As usual, we did not escape the museum without buying more railroad books, but at least we get a discount with our museum membership. We traded railroad tales with the museum volunteers until closing time, then headed back into downtown Carson City, where I decided to try and find the site of the V&T Shops based on the map I'd photographed earlier. We found a site that seemed to match the map, but a monument showed it as being part of the old Chinatown (it's now a parking lot and the Nevada Supreme Court building). Later research after we went home resolved the conflict: the street names have changed. The First, Second, and Third Streets on the old map are now Washington, Ann, and Sophia Streets (both names are on the map), while modern Second and Third Streets (there is no First) are eight blocks south. As near as I can figure it, the vacant rectangular space on this Google Maps view is the site of the V&T Shops as shown on the map I photographed earlier, and there are some pictures out there of what it looked like at various times in the past. I would love to see a modern Google map with the old V&T map overlaid on it so you could see where the tracks used to run, but I cannot find anything of that sort and I don't know how to make it myself. We briefly considered driving to Reno and doing grocery shopping, but we're pretty well stocked, so we headed straight home to Fernley. It was a relatively simple sort of pleasure today, but we enjoyed it.